You need some flathead (not Phillips) screwdrivers and a spanner wrench with pointy tips. To remove the flash connector socket, which is on the side of the camera, you unscrew the inner copper bit with your spanner wrench. The outer bit might invite you to grab and turn, but no, don't do that! You can simply pull it out when you removed the inner piece. There is a shiny disc - about 7 mm in diameter - at the back. 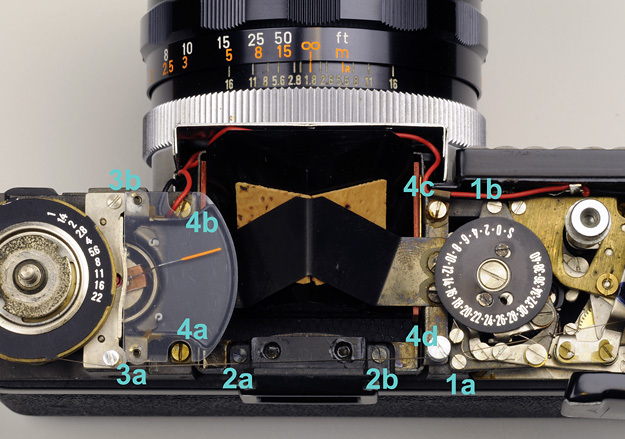 This covers the access hole to the lightmeter adjustment. There is no slot in it, so the only way to unscrew it is with a piece of soft rubber that provides a good grip. Set the shutter speed dial to a value that's easy to remember (say, B) and take out the centre screw with the two holes in it. Now the dial could be pulled off, but wait with that. Instead, remove the ASA/DIN selector plate and the spring underneath. You'll see three screws inside. Unscrew those and only then lift off the knob. The reason being is that the copper disc it was attached to is linked to the light meter with a string and it is best to leave that in place. A few more screws to remove and the top can be lifted off. On the picture below, I laid out the pieces in the vicinity of the places where they belong. The green arrow points at the tongue, which acts as a barrier for the spinning shaft of the second curtain. (Also see the sprocket wheels.) As a pin on that shaft hits this tongue, it pauses there until the tongue rotates out of the way. The clockwork in the slow speed escapement is responsible for delaying the rotation of the tongue. 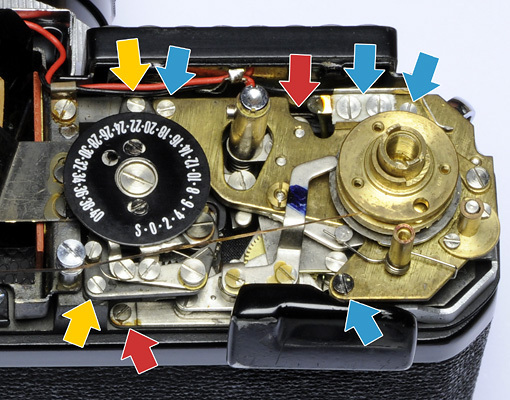 The blue arrow points at the arm, which is linked to the shutter speed selector dial. Notice, that as you switch from one speed to another, the above mentioned tongue moves closer or further away from the sprocket wheels. This is how it interferes to a greater or lesser degree with the spinning of the second curtain's shaft. You might find, as I did, that the tongue does not move out of the way at all, or only very slowly. The cause of this is dirt, old oil in the clockwork. Conversely, it is possible that the tongue moves freely, not providing any resistance. This is probably due to a spring that came out of its place. 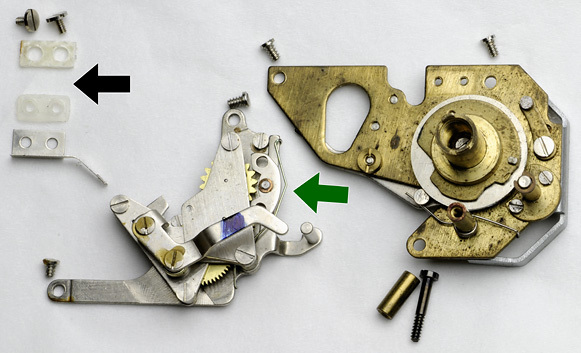 In both cases, the slow speed escapement has to be removed for fixing. The above picture with the colour coded arrows shows what screws to undo to achieve this. Yellow is for the frame counter unit, red is for the slow speed escapement, and blue is for the assembly with the shutter speed selector. (Conveniently, these pieces are made of different coloured metal, so it is easy to see the boundaries.) Perhaps the electric switch (which is for the flash, I think) needs special mention. It is near the right top corner of the picture. You either unsolder the wire, or take apart the switch. It is held down with two larger screws. You can see the bits on the next picture (except for the metal piece that is soldered to the wire). So, here we have the removed parts. 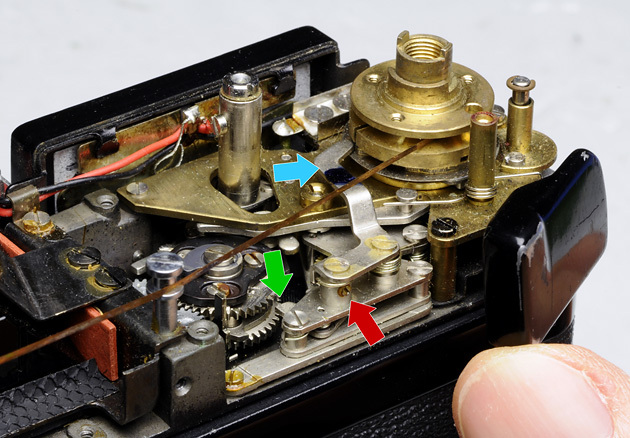 The green arrow points at the spring (a long piece of wire), which can easily get dislocated rendering the delay mechanism ineffective. This spring pushes a C-shaped metal bit against a yellow sprocket wheel. These parts have to be able to move freely. If there is too much friction - for example, due to dirt -, the thing just won't work. Dirt might not be visible to the naked eye. Rinse the unit in some solvent (e.g. lighter fluid) and exercise the mechanism. It will make a difference. When assembling the electric switch, you can refer to the picture to see in what order to stack together the pieces. The black arrow shows the place, where the metal bit, which is on the wire, belongs. After all is done, the camera top can be put back on. 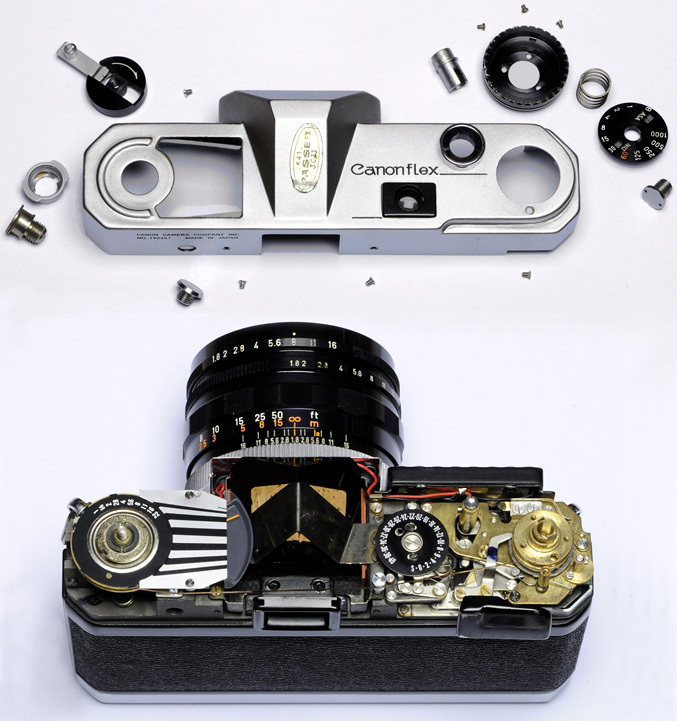 Remember to put back the shutter release button before you restore the cover. Also, remember to put back the little screw that goes under the shutter speed selector dial, before you fasten the dial back on. Yes, you've guessed it; I made these annoying mistakes more than once, that's why I'm bringing them to your attention. On the picture below, I numbered the screws that need to be taken out to eventually remove the viewfinder eyepiece and prism. The meter unit does not have to be fully removed, just lifted up a little bit, so that the prism can come out. The prism itself can be fully separated after removing the inverted V-shaped plate that holds it down. It is hardly necessary, though. The two pieces of cork may be stuck to the prism, and when you try to remove them, they can break and/or paint from the prism can peel off. And what about a faulty light meter? If the light meter does not work, don't despair, it might not be the sign of a dead selenium cell. On a couple of occasions I found that the culprit was some electronic component on the black wire that, in part, runs in front of the prism alongside the red wire. I don't know what it is exactly, as it is in a piece of black plastic tube, but by wiggling this section of the wire a little bit, the light meter can be brought back to life. Note: the Canonflex RM and a matching flash unit are described here. Pictures illustrate the camera from all sides.